I am a terrible cook. This news came as quite a surprise. 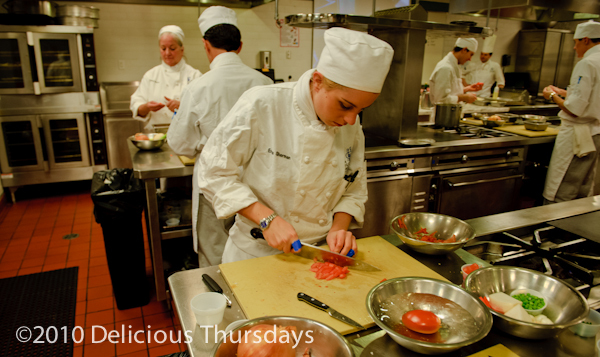 With nine Delicious Thursdays under my belt, I was confident I could create a few of my own culinary concoctions. After hibernating in my apartment for the stormiest part of the winter season and after several weeks of working in my very own tiny test kitchen, I realized I had not absorbed as much as I thought. In some sort of skewed and twisted logic I imagined my cooking skills would improve by osmosis. I had hoped that the closer I stood to the chef and the more time I spent near their stovetops, the better I would become. Yes, it’s true. I am here to report to you the disheartening news: After nine weeks of deliciousness my only results were a series of small meals that ranged from tough steak to rubbery scallops. Even my chocolate caramel tart came our lopsided – which is actually not my fault because my kitchen counter is lopsided. In fact – my whole apt is on a very obvious angle of about 15 degrees. Sloping floors: One of the only drawbacks of Greenwich Village living. Excuses won’t save me now. And so, with my latest kitchen failure – a pair dried out pork chops – I decided to send myself back to school. 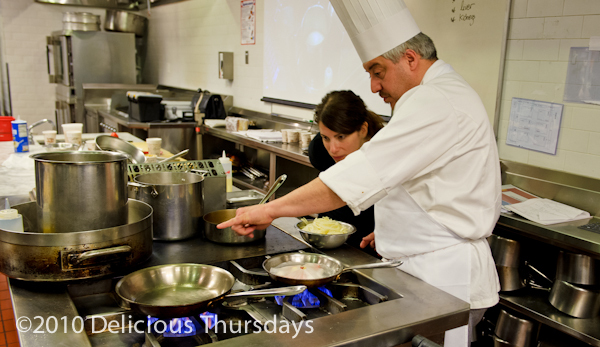 I spent last Thursday – stripped of my chefs coat and hat – at the French Culinary Institute where I trailed a Chef/Instructor in the hopes that I could learn a few lofty lessons before battling my broiler again. I arrive at 9:30 to meet the charming Chef X. X stands for Xavier and Xavier Mayonove is his full name but if I have learned one thing today, it is that in the kitchen the Chef is King and he must be addressed accordingly. 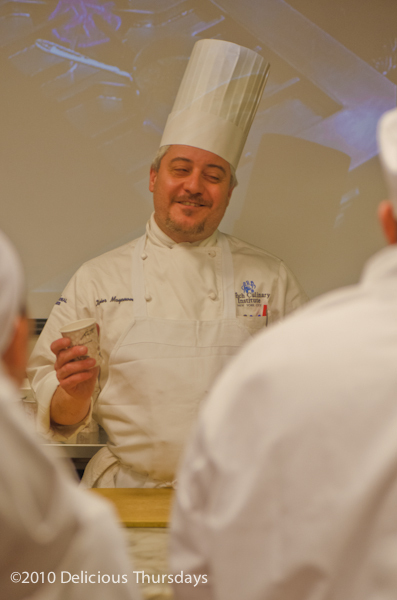 All the students refer to Xavier simply as “Chef.” As silly as it might sound coming out of my mouth, I will be a good student today and do the same. Yes, Chef. Thank you, Chef. Why are my scallops so rubbery, Chef? I was beginning to get the hang of the lingo. 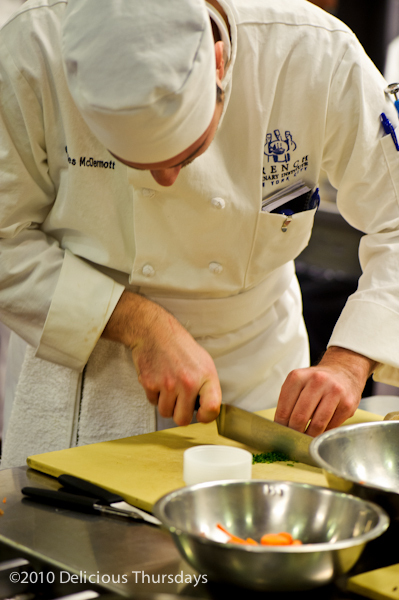 The word ‘chef’ literally translates to Chief or Head of the Kitchen and Chef X certainly embodies that spirit. He has a charming sense of humor. He is warm and welcoming. And while there is no question that Chef X is in command of his kitchen with his encyclopedic knowledge and his substantial skills, he is not intimidating in any way. At least not to me. 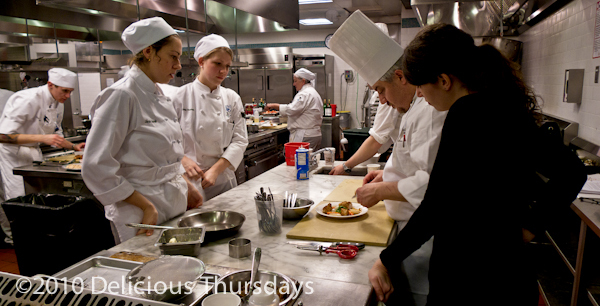 If Chef X wasn’t intimidating, the student kitchen in Room 402 of the French Culinary Institute certainly was. 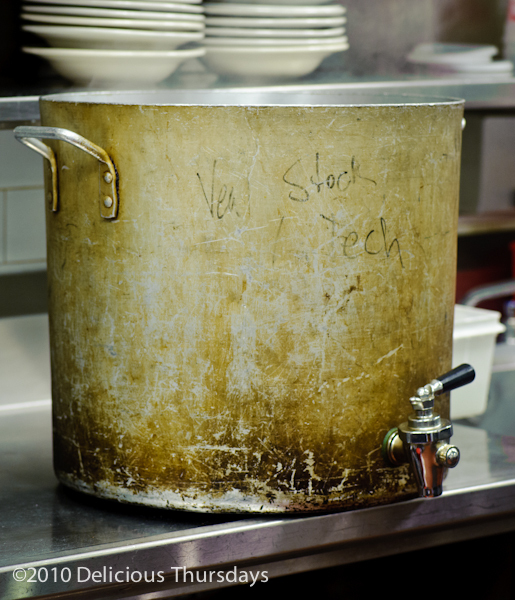 Twenty-four stainless steel stations complete with metal bowls, measuring cups and meat thermometers, and fully stocked with a series of saucepans and stockpots. I wouldn’t even know where to start or which pan to pick. The room is steeped in formality as students in starched white coats and proper chefs hats go buzzing about. This is serious business and the look on the faces of the FCI students says it all. They don’t make much conversation – they are more concerned about correctly chopping their carrots. I have seldom seen such dedication. I am overwhelmed with the students and their sense of devotion to the task at hand – however simple it might seem. Every slice of the knife, every massage of the meat is open to evaluation. In this room – technique is everything. It feels more like an operating room and these students look as though they are about to perform open heart surgery. This is no kitchen for an amateur like me. Do I dare possess the discipline to tackle the toughest tasks? Can I take the heat? At 35 years old (well, 36 in 1 week) am I too old to learn some new skills? Do I stand a chance at improvement? And will Chef X help? Mark Twain published The Adventures of Huckleberry Finn when he was 49. And Julia Child didn’t start cooking until age 32. Her first book was published when she was 49. Her television debut came a few years later when she was in her early 50s. Maybe there is hope after all. And maybe Chef X is the man to show me the way. 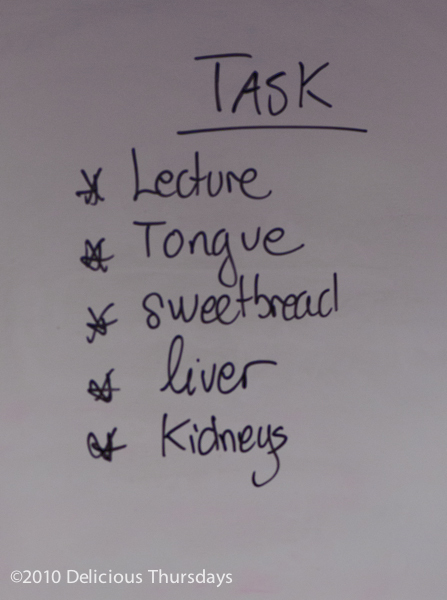 The topic of today’s class: Organ meats. And I’m glad because I have been having a meat issue lately – even my chicken turned out tasteless. First up: sweetbreads. Sweetbreads, I learn after a few minutes of Chef’s Powerpoint presentation on the subject, are the thymus gland of the animal – in our case we are using veal sweetbreads. Couldn’t I have picked an easier topic to tackle? Like a herd of cattle following our cowboy leader, we all gather closely around Chef X to observe his hands-on cooking lesson. He is a master in the kitchen. Four burners going at one time is nothing fancy for him, but I am impressed. I had difficulty managing just two. 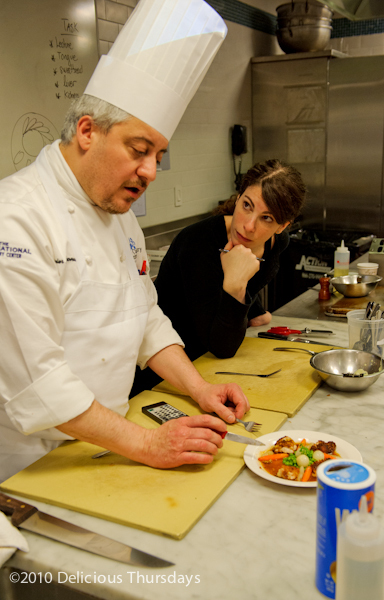 With ease Chef caramelizes his onions, sautes his sweetbreads, cooks his carrots and melts his marrow bone. Nothing burns or boils over. His turnips turn out right and his green peas and pearl onions are perfection. What’s his trick I wonder? And how could I become even and ounce closer to his level? In the corner of the kitchen my eye catches an unusual site: A tool box befitting of any handyman is propped up next to a stack of pots and pans on the silver side table. Is this just a box leftover by the refrigerator repairman or it is some clue to Chef’s kitchen success? I had to know. 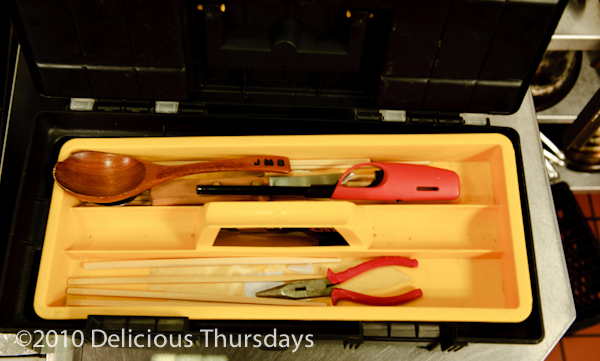 After Chef X leaves the front part of the kitchen to make his rounds, I quietly pry open the curious red and black toolbox to see what’s inside. To my amazement, the box contains tools but not of the refrigerator repair variety. Instead of a hammer and nails, I discovered layers and levels of wooden spoons and chopsticks, metal cleavers and knives – I even found a small food scale and a meat thermometer hiding under the second shelf. Is this Chef X’s secret weapon? I wondered about my own toolkit back home – or my lack thereof. Maybe that was the reason my meats turned out mediocre. My kitchen counter measures 2 square feet – and most of the space is taken up with an attractive wooden cutting board and a set of color coordinated napkins. My knives are not sharp and my pots and pans are hand-me-downs. Important lesson of the day: buy better equipment. Chef takes a liking to me and as we continue simmering our sweetbread sauce we get to talking. Chef X was born in the countryside of southwestern France. His love of cooking began during his early childhood. I wonder if this puts me at a disadvantage right from the start. Not only am I not French, but I only started cooking in a semi-serious fashion in the last few months. If Chef X began cooking in his teens, then I am lagging behind by nearly 20 years. 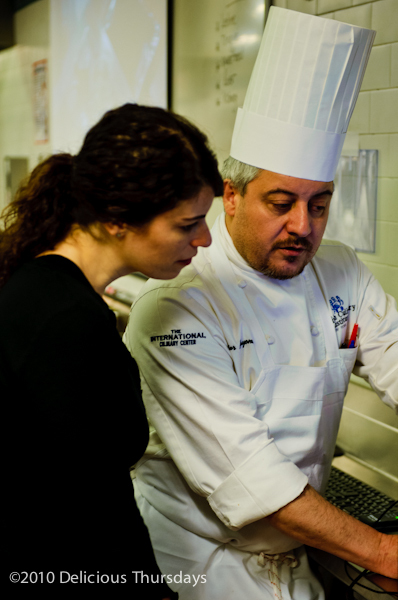 But Chef calms me down and insists that with the right tools, and the right ingredients (which for French chefs are simply butter, butter and more butter) I will make progress. But the missing ingredient, I already know, is discipline. These students surely have it. But do I? 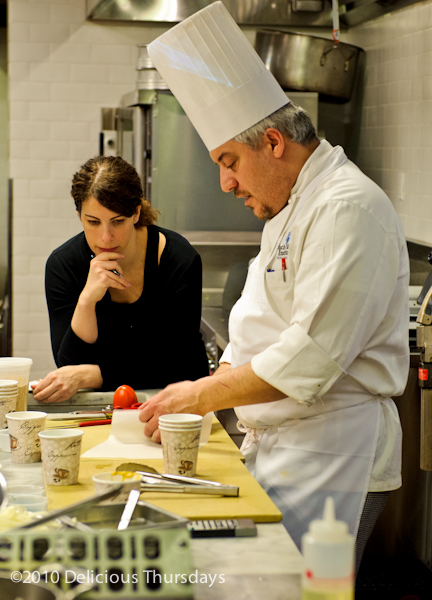 I have completed nine weeks of self-created cooking classes. My technique has been tutored but my skills have not truly been sized up. In nine weeks time, I have created a series of malformed mozzarella balls and a few misshapen pizza pies. I have burned my hand and arm and burdened my back, neck and feet. But those were baby steps compared to the caliber in this kitchen. 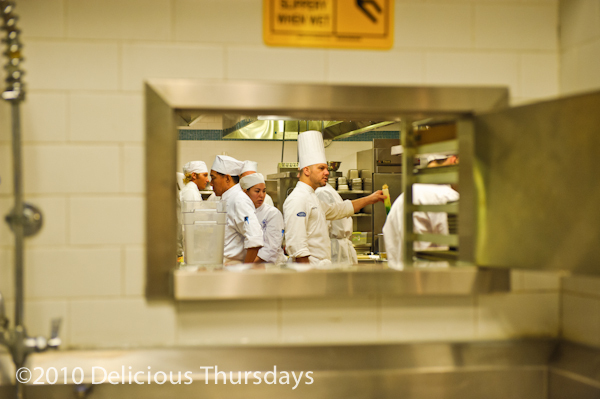 In this kitchen every move matters. From the cleanliness of my collar to the cut of my carrot – every action affects my success. 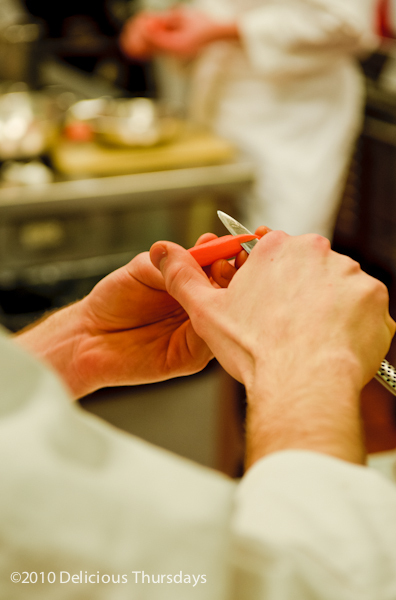 To be considered a great chef – and not just a common cook – my knives must be sharp and my cuts must be clean. Every aspect is to be evaluated. This is not your mom and pops kitchen. The temperature in our kitchen classroom is rising. I notice large beads of sweat beginning to form on the foreheads of the Level II students. They are about the perform their final task of the morning. 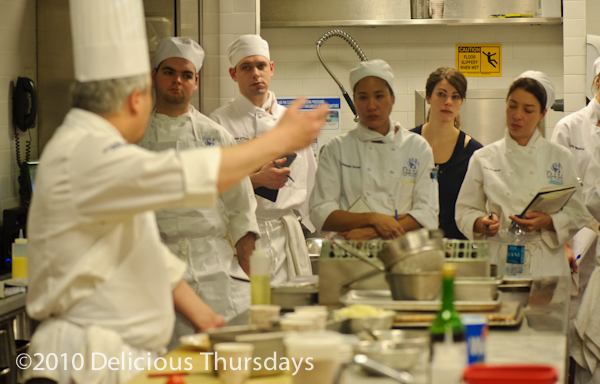 Each student is required to plate their prepared dish and present it to Chef X and I in the front of the room. 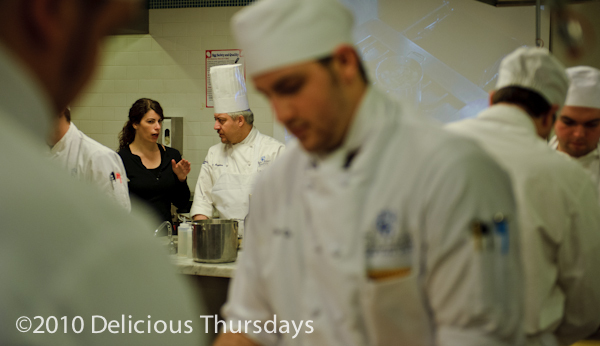 Scrupulous attention is paid to presentation, taste and timing – in equal amounts. A sea of classmates all watching and awaiting approval. The tension is high. One by one the chefs-in-training march to the front of the room – their hopes and dreams artfully displayed on clean white plates ripe for the judging. Chef X pokes and prods the turnips with the tip of his fork. Without even a taste he can distinguish the over-cooked from the under. A few tastes of the thymus. A few sips of the sauce. And within seconds Chef X offers his critique: Overcooked. Under-breaded. Not enough salt. Out of the 12 plates passed up for inspection – only two pass the test. Tough odds. When we order up at our local pub or sit down to dine over five-star fare – we take for granted the complexity involved in perfecting the plate. The main course and its sides must be tasty, timed to a T and presented with style. I’m lucky if I can even get my omelette to flip in the air without half of it falling flat on the stovetop. I can’t imagine I would be able to juggle more than one burner at a time. I’m glad I am safely behind the counter with Chef X and not parading my own measly meals in front of him. What would he think of me then? I don’t suspect I possess thick enough skin to withstand the criticism nor the discipline to vastly improve my skills. Not yet, anyway. 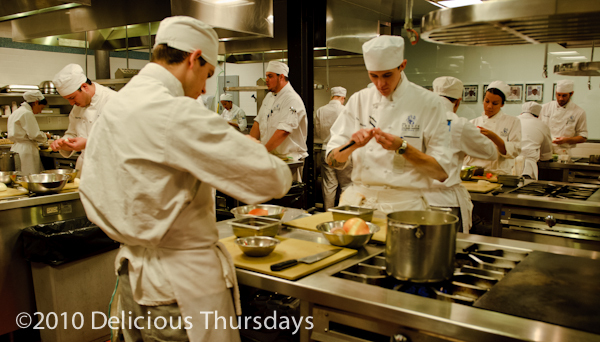 The students of the French Culinary Institute are put to the test in a manner well beyond what you and I ever experience. Their talents, their creativity and their resourcefulness are all on the line. My only judge is me – and the few friends and family who have tasted my treats in the safety of my home. I leave here today with a newfound respect for anyone who has the guts to get behind a burner and to present their creations to the community around them. 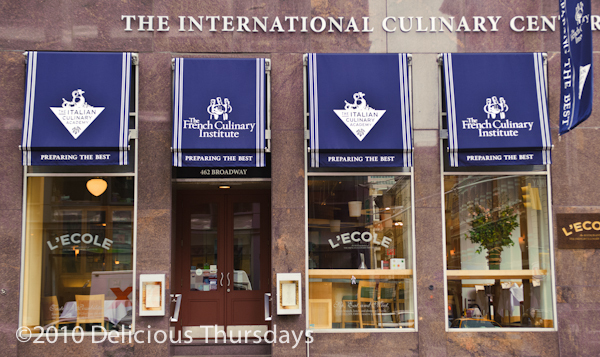 I left the French Culinary Institute and walked 15 blocks uptown towards my apartment on an unusually warm winter day. The air smelled as though spring was in sight and I was feeling optimistic. I stopped in to Ottomanelli Prime Meats on Bleecker Street and bought a radiant Rib Eye. I was ready for round two: The Chef vs. The Steak. I am now the proud owner of a brand new HDTV complete with cable – my first TV in almost two years. I have 200 channels but so far, I only use one. The Food Network serves as the musical backdrop for my culinary adventures. Now at home, I flip on the TV and consider it reinforcement for my morning lesson at the FCI. I studied my notes from my conversations with Chef X and found a few tips and tricks I could safely follow: I used my best pan, paid careful attention to my technique and used Chef’s three favorite ingredients: butter, butter and more butter. I used sea salt instead of table. Fresh ground pepper instead of pre-ground. Olive oil instead of canola. On the stovetop I seared both sides of the rib eye to seal in the juices and popped the pan in the broiler. Only a short while later I found myself eating the best steak I have ever consumed: Juicy, flavorful and cooked to perfection. I’m on my way. And while I’m not quite deserving of the title Chef, but you can certainly call me a cook. After 6 years (and counting!) 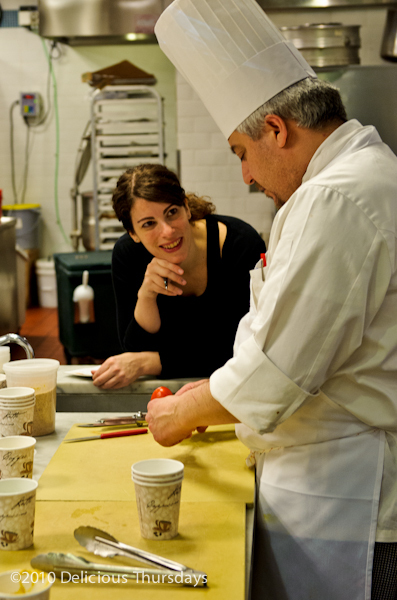 of working as a culinary tour guide for Foods of New York Tours, I became hungry for more. I decided to take a (de)tour and embark on my own journey, through the world of food. Week by week, I will spend one day (Thursday) experiencing (growing, milking, chopping, mixing, baking, tasting and delivering) a unique aspect of food and writing about it here. Tune in!